Since this library was installed in 2005, the room has been rearranged (no problem, since the library was built in modules). And the library has been expanded two times - first with three more bookcases, then with two more bookcases, built in a matching style, each approximately 9 feet tall. This large red oak library was installed in a home in the Tarrytown section of Austin. 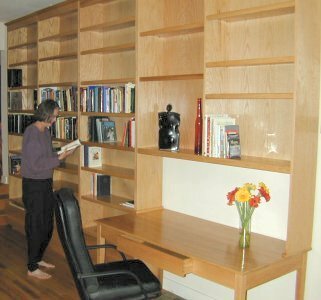 The 10 foot ceilings in this section of the house called for a tall set of bookcases, but the owners also wanted the option of later using the bookcases elsewhere. The house needed more storage, so separate drawer units, about a foot high, were built for use under the three primary 8 feet tall, 3 feet wide, bookcases. The table on the right end is the size of a normal office desk, with one drawer to give the appearance of a library rather than an office. The shelves on top of the table are almost 7 feet tall, and 5 feet wide. If later used elsewhere, the drawer units can be stacked to create a small storage unit. Each drawer unit is about a foot tall, three feet wide, and a foot deep. with one of the owners standing next to it. Library Ladder .... Originally we saved space in this project to store a library ladder, but later used that space for an entertainment center. If you would like me to build a library ladder as part of a larger project, I would be glad to, but if you are just looking for a library ladder, I suggest you consider one like this, built by David Petersen. 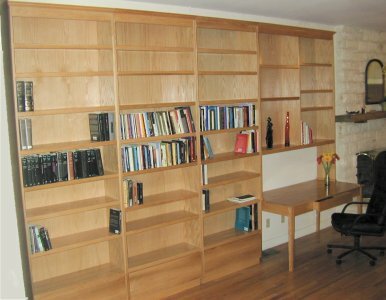 Red oak furniture grade plywood was used for the bookcase sides and shelves to provide strength and stiffness. 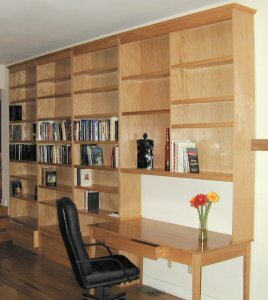 Solid red oak hardwood was used for the desk and the support and trim pieces of the bookcases. Visible plywood edges were covered with red oak veneer. A clear lacquer finish was applied to all surfaces. Each of the three bookcases stands on a base that provides a 3 inch high kick-space. Each base is 34 1/2 inches wide, designed to support either the drawer unit or the bookcase by itself. The drawer units provide a similar base to support another drawer unit or one of the bookcases. 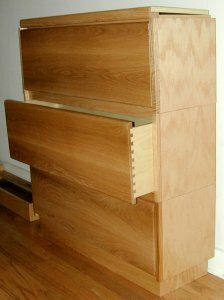 The drawer boxes are 1/2 inch baltic birch plywood for stability, attached to the solid oak front with dovetail joints. A finger pull is milled into the bottom of each drawer front to avoid the distraction of handles. Each of the tall bookcases has a fixed shelf about 3 feet above the bottom of the bookcase section, to provide stiffness to the overall structure. With the overall height just under 8 feet, the top area is just less than the 5 foot maximum area without a fixed shelf. Six adjustable shelves are included with each of the three tall bookcases, for a total of 8 usable shelves or almost 25 feet of shelf space per cabinet. The top of these cabinets are flat, with shop-made cove moulding on the top-front of all cabinets, plus the sides of the two end cabinets. The cabinets were tied together at the top (a board screwed to the top of adjacent cabinets) to maintain alignment and add stability. That board can be removed to use the cabinets independently. The table unit is the size of a standard office desk, 30 inches high, 30 inches deep, and 60 inches wide. There is a single drawer to maintain the "library look" rather than looking like an office desk. The drawer sides are 7/16 inch thick solid ash, attached to the drawer front with dovetail joints. A five foot wide bookcase sits on top of the table, and extends to the height of the other bookcases. Five feet is too long for most shelves, so a divider provides for shelves about 2 1/2 feet long. Extra bracing is provided to support the bottom shelf (which, in turn, supports the divider). Tables can be almost any size, from a small study carrel to the size of a full size desk, as in this case. Desk height is typically from 29 to 31 inches, with 30 being most common by far. If drawers are included at the sides, allow 24-28 inches for "knee space." Side drawers typically allow 9 inch inside space on small desks, or 12 inches inside space on office desks. This entire site (layout and contents) ©2003-2013 by Charles A. Plesums, Austin, Texas USA. ALL RIGHTS RESERVED.